Now then if I were to ask you what the most unique boxes were for the 2600 I’d expect to hear answers like Commavid for their amazing box art, Bomb for their unique cutout design and included iron-ons, Tigervision, Mystique, the list goes on. Almost every publisher had a thing that made their boxes stand out on the shelves, but what if the best of these boxes were never actually sold on the shelf, and were instead sold online. What about homebrews? Yes, the homebrew scene on the 2600 is immense. It seems that there are more homebrews released for the system every year than there were in the final five years of its retail run, and as the technology becomes better and cheaper the things these homebrews can do becomes greater and greater. I have two homebrews from AtariAge, them being Mappy and Draconian. I also have an oddity that I will lump in with the homebrews, a while back AA user Brian O noted that an old box design he made for Raiders of the Lost Ark surfaced on Ebay even though he never really distributed the box. I now own this strange one-off box. So let us dive into the fantastically artistic world of AtariAge homebrew boxes! The box art for Draconian is incredible, it depicts your space fighter bum rushing a squadron of enemies as several enormous space stations approach from the distance. On the sides of the box both the missiles and spy ships are featured below the title. The art by Nathan Strum is highly detailed and looks almost photorealistic. The artwork takes the Tigervision approach in that it wraps around the entire box making the whole thing extremely eye-catching. One thing that Tigervision didn’t do however was make the art seamlessly wrap around the entirely of the box like Draconian has done. The back of the box has high quality screenshots/artist renditions of the game and details the premise of the game while also tying in to the gameplay, it’s all around good stuff. Mappy takes a bit of a 180 and turns from hyperrealism to goofy and cartoony with a hint of abstract. The titular Mappy is throwing open a door waving his billy club as he’s pursued by Goro and one of the Meowky, the orange and purple cats. In the background you can see a television flying through the Void and the Mona Lisa behind another open door situated in the Void. The box art doesn’t completely wrap around the box but it does stretch to both sides of the box giving each a unique side, just like Draconian. The back is simpler than Draconian’s, but not by much. There is some more wonderful artwork from Nathan Strum showing Mappy leaping from a trampoline reaching for a bell which he will then presumably drop on the heads of the three pursuing cats. The blurb is short but details the premise well and the screenshots/artist renditions look just like the in-game graphics, there’s no need for embellishment here. This design is in stark contrast to the other two which were bright colorful and detailed and goes for a more subdued minimalistic style. The front has only a picture of the in-game Ark of the Covenant and the title with accompanying game information. The box is almost completely black with only the writing, Ark graphics, and two small grew swooshes on the front bottom left and back top right. The back has another Ark but is smaller with the blurb underneath it. The blurb is straight from the manual but it get’s the point across well. There are no pictures of the game itself anywhere on the box, as I said it is pretty minimalistic. Honestly I do rather like it; it has a sort of mystical/mysterious air to it. The AtariAge boxes are made from standard thickness card stock and have a nice professional smooth and glossy finish to them. Unfortunately finishes like this have a tendency to show any and all damage that happens to the box, even though I’ve kept them in box protectors and they rarely feel the open air they do have several dings and scratches. Raiders on the other hand is constructed from very thick card stock, probably 50% to double the thickness of the AA boxes. It also lacks the shine of the others which leads me to believe this was not professionally printed. Since the box is completely covered in matte black ink it is almost sticky to the touch if you have even a whisper of moisture on your hands. The Raiders box doesn’t show damage as easily as the AA boxes though as the non reflectiveness of the ink hides most small dings and scratches, but this has a small caveat. Since it lacks that shine small smudges and scrapes will never come off, and if even a drop of anything liquid touches the box it will disrupt the ink and create irreparable damage. This thing will have to live inside a box protector until the end of time. 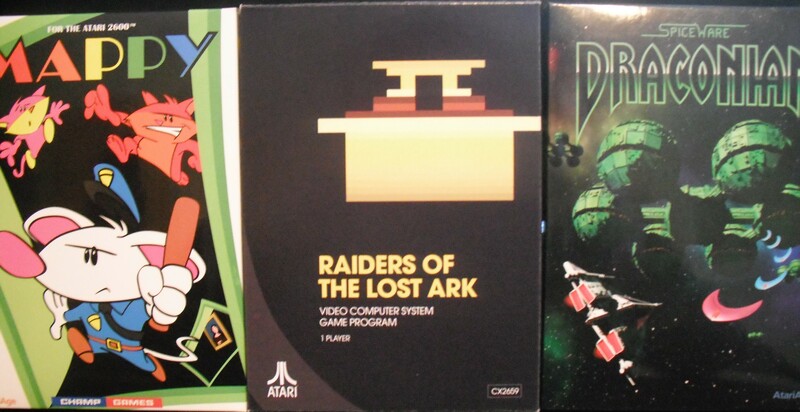 All three of these boxes use the same AtariAge style insert, I don’t know where the Raiders box got theirs but it has one. I personally don’t like these things, they hold the cartridge in the center of the box, making it rather difficult to get the cart out without removing the insert as well. I personally prefer the style that most other publishers used, but those had their own issues. Both the AtariAge manuals are high quality affairs. Each are printed on high quality thick glossy paper and are filled to bursting with even more custom artwork from Nathan Strum, actually Nathan designed both of these manuals in their entirely. Each manual is themed with their respective game and each is full of pertinent information, as manuals tend to do, Mappy even includes a full color comic detailing the premise of the game and how to play for people who don’t want to read the text. The Draconian manual looks and feels like a military debriefing, like it should have classified stamped on the front. The Raiders manual is just the standard Atari manual, nothing special. The Raiders cartridge is just the standard Atari Silver Label cartridge, there is nothing custom here. The AtariAge cartridges use the standard Atari shells, probably long dead Combats, and simply have a custom glossy top and front label of the box art for the game. They all do the job well. Well… Would I recommend that you go out there and buy every single homebrew that you can get your hands on? Well no, even though it supports the site and the creators on it I would recommend that you only get the homebrews that you want, that’s why I only have two. These games aren’t cheap either; they sit at around 50 dollars for boxed copies and 20 dollars for loose cartridges, though some are higher or lower. I will admit though that the moment Wizard of Wor Arcade comes out I’m buying it immediately. As for the Raiders box, well I don’t think you can actually buy it anywhere as this seems to be a one-off printed by somebody in their basement, if you want one I’d recommend talking to Brain O, the designer of this box, and talk it through with him. I paid way too much for this box but I honestly don’t care, it’s a weird one-off that was never really meant to exist in the first place and I love stuff like that. Thanks for the kind words! I had a lot of fun working on those. Darrell and John pretty-much allowed me to indulge myself in creating the artwork. Glad you noticed that the Draconian artwork completely wraps around the box - I was wondering if anyone would pick up on that. Have you ever thought about releasing some of your artwork as posters? Not like the small ones you get in the boxes (which I do have hanging on my wall) but like full-sized posters? I'd snap those up in a heartbeat! Nathan did an awesome job. As opposed to the military, the manual for Draconian actually takes it's cue from the Haynes auto repair manuals from the 80s, like this one. Have you seen the desktop image Nathan created? It's available for download in 4K and 5K versions at the bottom of the first post of the Draconian topic. 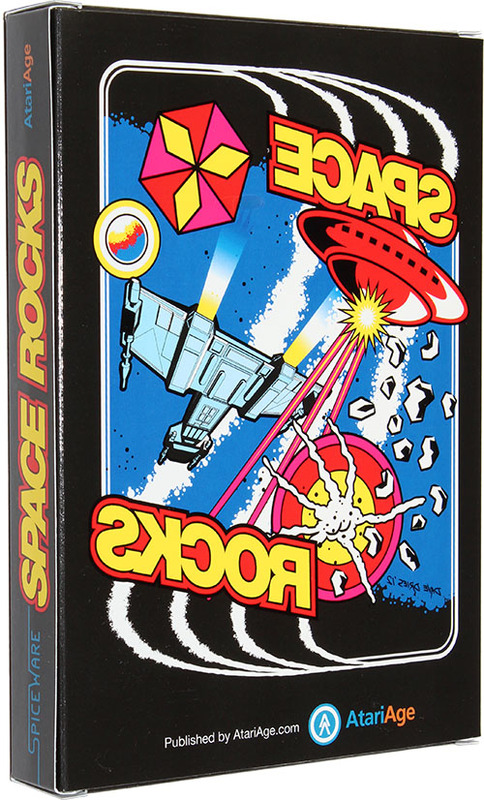 I love the box Dave Dries did for Space Rocks; instead of screenshots and instructions for a game everybody already knows how to play, the back of the box gives us a view from the other side. He also had fun with the end flaps, as seen in this reply. 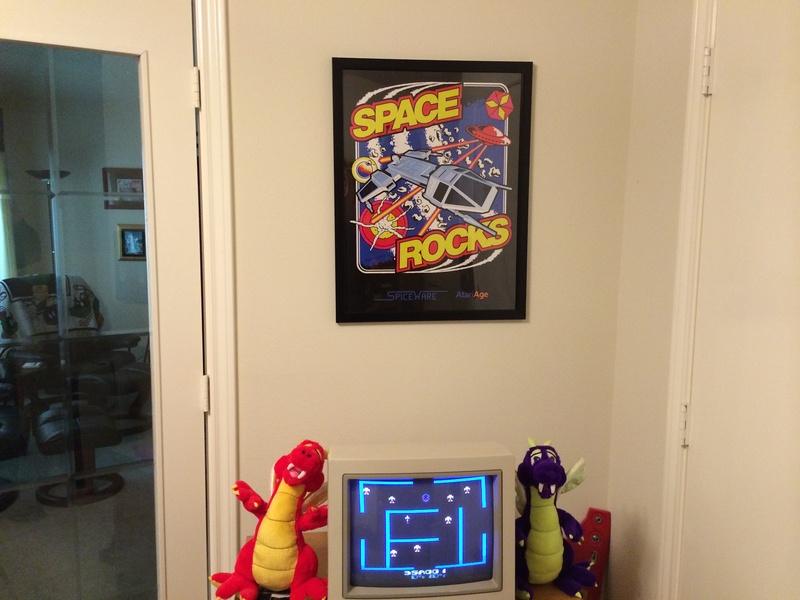 Large posters have been done for some games such as Space Rocks. I don't think they don't sell well enough vs how many have to be printed to make it a regular thing. I haven't, since usually after I finish the artwork for a game I'm sick of looking at it. Albert would be welcomed to offer them, but I don't know if it's worth the up-front expense, or if he could find a way to have them done on-demand. I'd be happy if the small ones just came in a tube, instead of being folded, but the whole point of those is fitting them into the box. We've provided large-format versions of the artwork for banners that Albert uses at game expos, but that's a bit overkill. Nathan did an awesome job. As opposed to the military, the manual for Draconian actually takes it's cue from the Haynes auto repair manuals from the 80s, like this one. He wasn't far off though. Even though I visually borrowed from the Haynes manuals, my original idea (and the written text) was basically meant to be like a classified briefing for how to use your shiny new spaceship. Originally I was trying to figure out how to design it that way, but then the Haynes idea popped into my head. I think that the Raiders box was done by Brian O (who I am a big fan of). At one point he was churning out terrific box concepts; I think that he did similar mock ups for space invaders and at least one other game. regrettably, I can not make the search work well enough to easily find a link. At least I wasn't too far off the mark. I wouldn't have made the connection to the Haynes manuals since I haven't heard of them until they were mentioned here. The power of obscurity?